Anyone else love the look of wood signs, but the time commitment with prepping the wood, creating the stencil, paining, and sanding causes it, all too often, to become a back burner project? If you're one of us, I have the sign hack of all sign hacks for you! The key is these wood-look tiles and your Silhouette...of course! 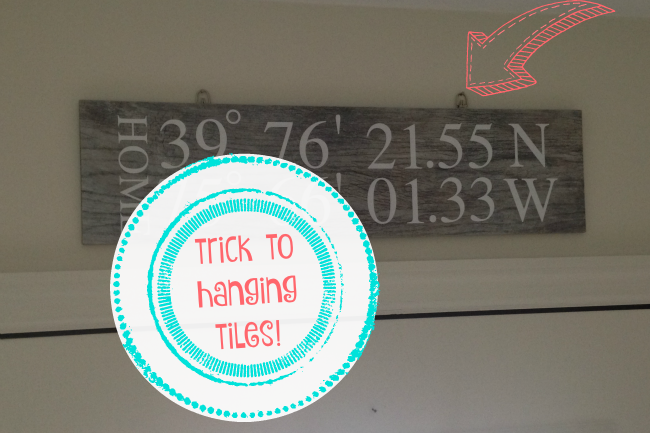 Plus I'm going to share the trick to hanging tiles! Are you seeing the beauty in this yet: buy faux wood tile + add vinyl. Wham bam thank you ma'am you're donezo! Now let's talk about designing for these. I've done several several different designs on these tiles, and I always do the designing in Silhouette Studio the same way. Start by making a mock up. This tutorial explains in depth about why mockups are hugely important for designing so if you need a refresher check that out. Otherwise, I'm going to breeze through the mockup design steps. 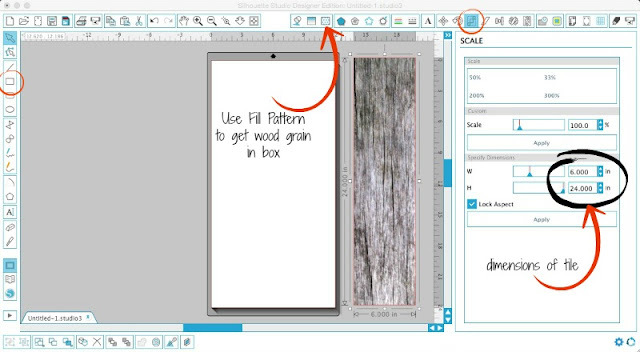 Use the Draw a Box tool (circled on left sidebar) to draw a box. Open up the design from the library (or create a new design) in Silhouette Studio. Using the box representing your tile as a guide, appropriately position and size the design. 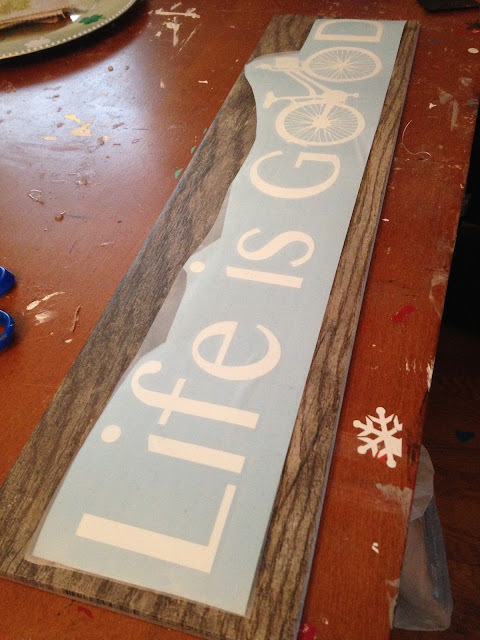 My mom loves to ride her bike so I made this Life is Good sign for her and that's the one I'm going to demonstrate this tutorial with. (I created the design by just grabbing a bike I had in my library and typing the text around it...you may need to ungroup the letters to arrange around the bike.) I've also put longitude and latitude coordinates on tiles (see below). You can find the longitude and latitude coordinates of any place by plugging the address in to this website. Whatever you decide to put on your wood look tile, use the mock up to size the design so it fits on the tile. 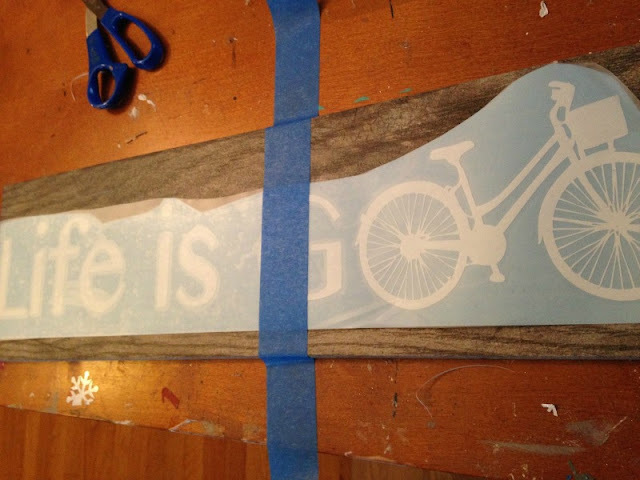 It's best to cut on permanent adhesive vinyl because it sticks to the tile easiest. The issue I have run into is that, for this project specifically, I like a matte vinyl (not glossy) and as you probably know most matte is indoor vinyl. BUT....there happens to be this thing called matte 651/permanent/outdoor which comes in only black and white. Seriously, it's like my favorite vinyl ever. Since I think these tiles look best with black or white anyway, I was in luck. Cut your design and weed it. A 24" cutting mat makes this much easier, but if you don't have one you can cut the vinyl without the mat to avoid cutting it in sections on a smaller mat. Just remember, since you're cutting longer than the standard 12x12 you'll need to change your Page Settings. If you're using the 24" mat, change the height to 24" and from the the Cutting Mat drop down menu select 12 x 24 in. 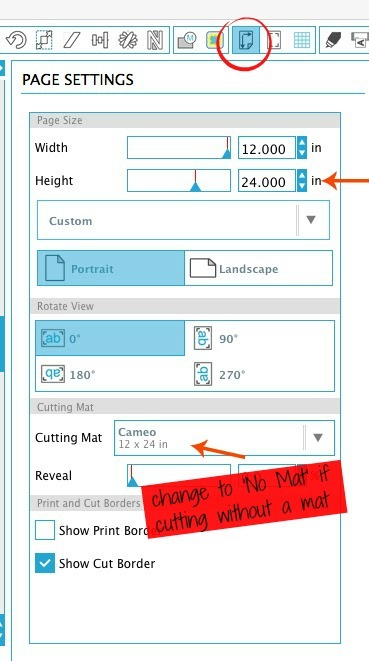 If you're cutting without the mat (or on a Portrait which has no 24" mat), enter the length of the vinyl in the "Height" box and then change the Cutting Mat option to 'No Mat." To add the vinyl to the tile you want to make sure the tile is at room temperature. A really cold tile makes it very difficult for the vinyl to stick. 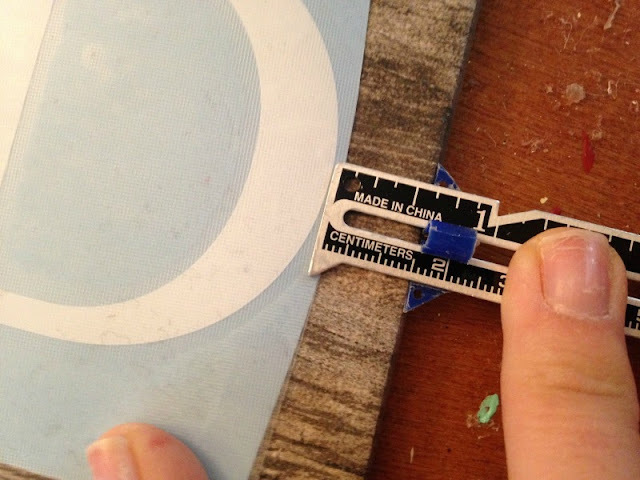 It's easiest to use the hinge method to apply the vinyl to ensure it's straight, centered and even. If you're not familiar with the hinge method - your crafting life could be like 693% easier and you could have like 42,382 fewer gray hairs so go read up on this method! You can use clear transfer tape or transfer paper for this. Whichever you use, de-sticky it a little by blotting on a clean cotton shirt or the arm of the couch. Basically what you want to do is put the transfer tape onto the vinyl. Leave the vinyl backing in place. 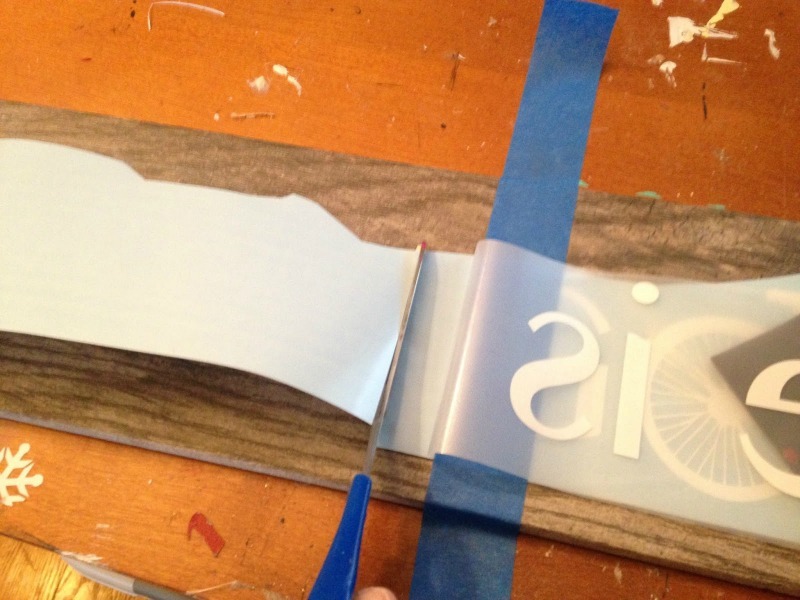 Trim down the edges of the vinyl backing and tape so they're even and so they're close to the vinyl design. Place the vinyl sandwich (tape on top, vinyl in the middle, vinyl backing on the bottom) onto the tile. Now you're going to grab some painters tape, scissors, and a ruler and keep them nearby. If you have a sewing gauge ruler (my favorite ruler ever) you are golden. Measure in from the sides, top and bottom to perfectly position the design. When you get it just right, rip off a big piece of painters tape and place it vertically down the center of the tile. You want part of the tape attached to the floor or table top, wherever you're working, then over the vinyl sandwich, and back onto the other side of the work surface. I apologize for the odd angle on this....I definitely could have used a third hand. Use the ruler to double check that the vinyl decal didn't shift at all while you were taping. If it did, life one end up of the tape and slightly nudge the design back so it's even. When you get it perfectly in position, peel back the transfer tape on one side of the tape. The tape will stop it about half way across - that's the hinge! The vinyl should peel up with the transfer tape. Use your scissors to cut the vinyl backing, near the tape hinge. Don't worry if it's not right at the tape line. Move the backing out of the way and carefully place the transfer tape and vinyl onto the tape make sure there are no bubbles. Smooth it, don't worry about burnishing yet. Remove the tape hinge. The transfer tape is going to keep everything in place now. Lift up the other half of the transfer tape, just enough so that you can remove the half sheet of vinyl backing that remains. Again, lay down the transfer tape with vinyl onto the tile. Now burnish the entire design onto the tile using the Silhouette Scraper or a credit card. Starting at one of the corners, slowly peel away the transfer tape or paper. You may need to slightly encourage the vinyl to stick to the tile as you peel back the tape. After the tape is remove, go back and really burnish the vinyl onto the tile so you can slightly see the ridges of the tile through the vinyl. I do this with my finger. The last thing you want to do - and this is optional - is to put a thin protective layer of cork on the back of the tile. I glue it on with the industrial strength E6000 and then use an Xacto knife to cut the roll away. This is it if you're planning on leaning your faux wood tile on a shelf or mantel. 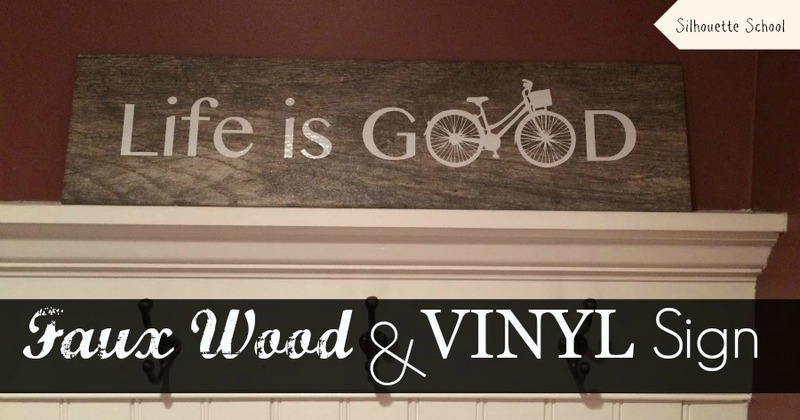 If you'd like to hang your vinyl and fake wood sign, use E6000 glue to attach two D hooks - one on each side. Let them set for at least 24 hours - preferably with a clamp or something really heavy on top. Then add your piece of 1/16th" cork roll to the back to protect against scratches. Flip the tile back over and carefully place something heavy on top for another 24 hours to let the glue dry. 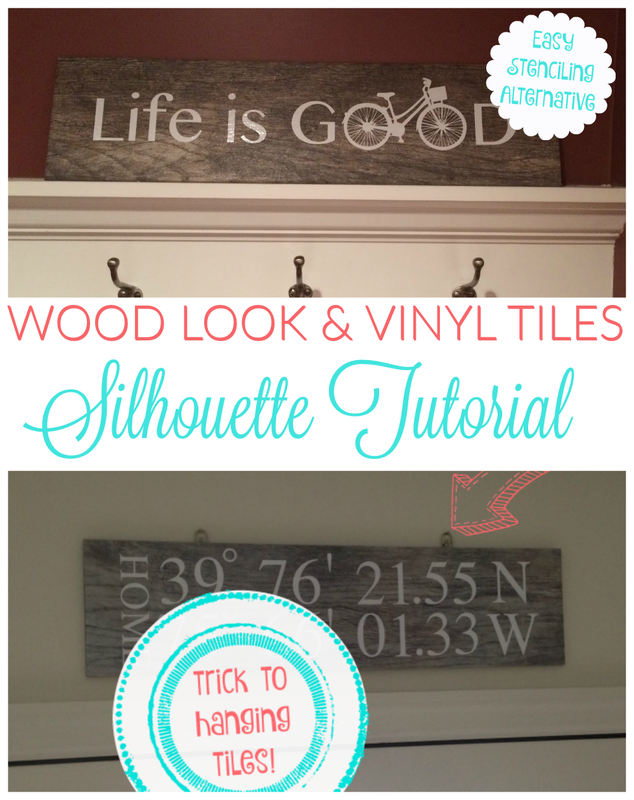 That's it - you're ready to hang your wood look tile! OMGosh. Amazing. I know what I am doing for people for Christmas. Great tutorial and exact step by step instructions make it so even a newbie like me can do this. I would love to know if this were possible. I'm sure it will be very heavy and wouldn't be able to hang on the wall but very cool idea. I wonder if you could paint on these tiles or just use vinyl? Great, detailed instructions - I love these "wood" signs! You've just changed my life!! I can't wait to make some Thanksgiving and Christmas "wood" projects! Thanks, the instructions are very detailed. I love anything that looks like wood. Oh this is such a great idea! THANKS for all the detailed instructions - I can't wait to get started on Christmas and wedding gifts doing these!! Before seeing this, my husband and I went to Lowes to look at pine boards for signs. We found these floor tiles but they wouldn't sell just a few. You had to buy a carton! Darn, should have gone to Home Depot!!! I enjoy and appreciate your time doing the Silhouette School! These types of factors consist of the sort of flooring to get included, tile wet saw reviews how much targeted visitors the bedroom becomes, precisely how the room is employed, along with the room' position. Tiles range in their shapes, models as well as in their hues. Love it! Where did you get the bike file? I need it for a friend!! However, In your search for a good in addition to right tile saw, ensure that to help get in bank account your current tile saw water pump. Just really love it! You shared very useful tips, together with clear pictures. Thanks! These days, many people are considering designed timber made symptoms as very special especially when placed in houses and companies. An outstanding timber indication at your home's entrance can bring about a traditional sensation. Thanks for this - it definitely makes woodwork seem less complicated as it is! I'd probably give this a go as a gift for my parents' anniversary. Love it!! Thanks for all the wonderful tips! You always have such awesome ideas! I am going to get me some wood tiles (even though I actually love the wood prepping part). Thank you for these instructions.I tried it and it worked like a charm. I, also, love inspirational words around my house. I might just go a little overboard with this. Thanks again. As of late, lots of individuals are thinking about specially designed bushes constructed warning signs mainly because rather exceptional especially when set real estate together with agencies. A great bushes warning sign and your living room's top can lead to an authentic impression. I have also seen "wood look" vinyl tiles and "marble look" vinyl tiles with adhesive on the back. Essentially you would peel and stick to the floor - but you can just peel/stick to an easel back. Even better than these ceramic tiles because 1) they are lighter 2) don't break if they do fall.